I am sure you have heard that breakfast is the most important meal of the day. Eating a healthy breakfast can help get your day started off right! This is what I have for breakfast pretty much every day. 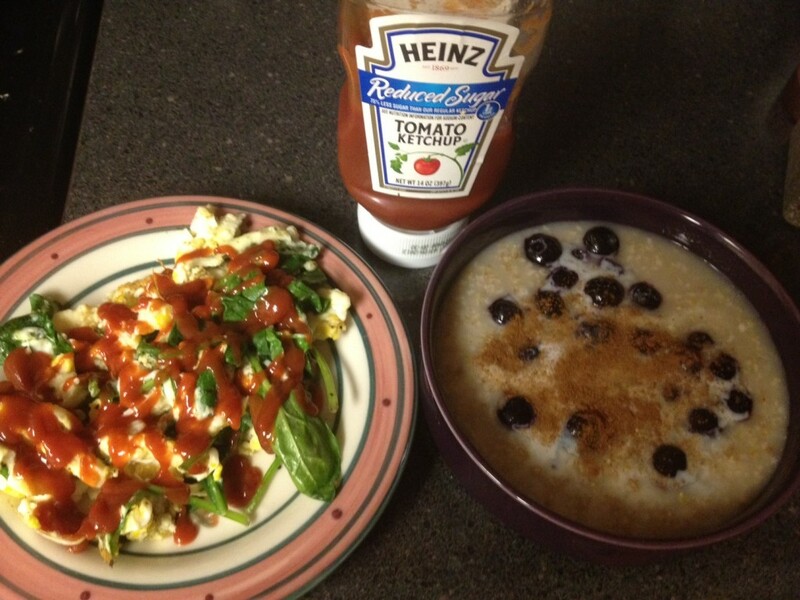 An egg scramble and steel cut oats make a quick and healthy breakfast that will fill you up and boost your metabolism! To make this scramble, all you have to do is scramble the egg whites and whole egg together. Add this mixture to a pan and throw in some spinach, mix the spinach into the egg mixture. Once the eggs are cooked, add paper and reduced-sugar ketchup! I usually do old fashioned oats because it’s faster but I made a big batch of steel cut oats yesterday, so I just re-heated these real quick. You can top your oats with anything but I like to keep it simple with blueberries and cinnamon! I used to be the girl who never ate breakfast and I would just have a cup of coffee to keep me full until lunch. Then I would usually end up snacking on something unhealthy because I was hungry, eating a huge dinner and usually giving in to cravings at night. I never looked the way I wanted with this plan. I kept thinking that because I was ‘cutting calories’ out of breakfast it would help me lose weight, but the reality is that it slowed down my metabolism and usually caused me to binge and eat more junk food later. Most mornings I don’t really feel like making breakfast. But, I do it anyways. I wake up 5-10 minutes earlier so that I can make my eggs and oats. I find that when I eat a healthy breakfast with protein and complex carbs, it makes it SO much easier for me to stay on track the rest of the day. Breakfast doesn’t have to take a long time to make, it can be easy and delicious! There are many healthy breakfast options to choose from, making it easy to find something you love that will start your day off right. What was on your plate for breakfast this morning? Share your healthy breakfast recipes with me!